Tea from marigold is great for the stomach, liver and skin. Apart from this natural drug, marigold oil, calendula ointment and healing tincture is also used. Together they make an amazing tandem to treat the whole spectrum of various diseases, and are extremely valued in traditional medicine. In this article, we have prepared some excellent recipes for Marigold tea. In addition to being very decorative, marigold plant is highly regarded in folk medicine and is a part of the most famous and most effective tea blends. Marigold tea in phytotherapy is most often used in its distinctive orange colour, but stems and leaves of these plants are also healthy which must be harvested when it is sunny, because then they have the strongest effect. Marigold is known for having a flower that very slowly veins, which suggests the name of this valuable plant whose distinctive smell keeps many insects and plant pests away. Because of this it is often planted in gardens. In addition, it is a quite reliable forecaster of the weather - if the marigold flower does not open after seven o'clock in the morning, it means that it will rain. In ancient times magical powers were attributed to this plant, until now we known it has an anti-inflammatory, antibacterial and antiseptic effect. It is highly appreciated and is included in many of the latest scientific research in the treatment of cancer. Marigold tea is remarkable for internal use while domestic marigold ointment is effective for wounds, warts, eczema, cuts, burns, blisters and sores on the skin. MARIGOLD TEA, WHAT IT IS USED FOR? Thanks to its complex composition, marigold tea, oil, tincture and fat are used as aids in the treatment of a wide range of diseases. Marigold is composed of fairly large amounts of flavonoids, which provide anti-inflammatory properties, as well as tannin, triterpene saponosides, carotenoids (they give flowers a beautiful orange colour), glycoside kaledulozids, little essential oil and a few organic acids. Marigold is a very important component in tea blends used in the treatment of diseases of the digestive tract. Marigold tea heals wounds - stomach ulcers and duodenal ulcers, normalizes the liver and bile secretion, relieves pain in the stomach, and thanks to the anti-inflammatory effects of flavonoids, marigold tea soothes inflammation of the colon. The large presence of mucus and tannins justifies the use of marigold to stop mild diarrhoea. It is an exceptional tea from marigold and yarrow nettle which is recommended for women that have cystic changes on the ovaries or any other unpleasant gynaecological problems. 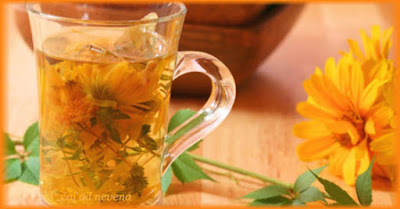 Marigold tea in gynaecology is widely known and gladly recommend to women. It must be noted that marigold tea is almost never cooked, if it is prepared individually then a tablespoon of herbs is poured with 2.5 dl of boiling water, covered and left to rest for three to five minutes. The tea should not be sweetened with sugar. The tea for cysts is made by equal amounts of marigold, nettle and yarrow (milfoil) take two tablespoons, and cover them with boiling water and let it rest for a little longer covered for 15 to 20 minutes. Marigold tea has an antispasmodic effect, it can remove uterine cramps, PMS and relieve the problems associated with menstruation, establishes a normal cycle, and also eliminates the spasms of the airways - which is especially important for patients with bronchial asthma. If you want to rid the body of toxins, marigold tea is the right choice for you. It has been shown that tea from this plant very effectively cleans the blood, stimulates the functioning of the liver, removes acne and eczema on the skin, eczema, and herpes virus. It has been discovered that marigold plant cleans the blood vessels, relaxes them and lowers the level of cholesterol and fats in the blood. Recent studies have shown that marigold plant lowers blood pressure and acts as mild sedative, so it is recommended in the case of angina pectoris. In addition to its internal use marigold tea gives exceptional results when it is applied from the outside – on the skin. Preparations based on marigold belong to the most powerful anti-skin conditions including wounds, burns, eczema, psoriasis, impetigo and fungal infections. It stimulates the formation of new cells and removes abscesses (especially nails). Old folk recipe against pimples on your face is this: Wash your face with marigold tea in the morning and at bedtime and keep the treatment 10 to 14 days. As much as it is good for our face, it is so effective for baby skin irritated from plasticized diapers. Soak the handkerchief in mild Marigold tea and wipe the baby's skin, especially on irritated parts of the diaper, it will alleviate itching and help your baby sleep better. Take two tablespoons of marigold flowers and pour half a litre of boiling water. Remove from heat, cover and allow it to rest for fifteen minutes. Filter after to get the marigold tea. Thus obtained Marigold tea is especially recommended for the above mentioned impetigo, caused by staphylococci or streptococci and it is a persistent bacterial skin infection. The tea is good for varicose veins and inflammation of haemorrhoids, because it calms all the nasty inflammatory processes. For the face it helps with acne, eczema, insect bites, and warts. Ophthalmologists recommend this gentle herbal tea as an eyewash in problems with conjunctivitis, and you can wash your face with it and to rinse the gums after tooth extraction, you should gently rinse oral cavity in order to disinfect it. Take care not to swirl it too hard in the mouth, in order not to mechanically remove the clot and again start the bleeding. Marigold tea in this case should be chilled. If you are pregnant do not use marigold without prior agreement and consultation with your physician who follows your pregnancy. It is know that you can use a mild herbal tea for the skin. 10 grams of dried flowers are enough and pour it with 1 dl of water and let it rest for a while at room temperature. Domestic marigold fat and oil are used in the treatment of pain, dilated and inflamed veins, fungal infection of the feet and fistula. Fat of these herbs is one of the best anti haemorrhoid preparation. Marigold tincture is applied in the form of patches in case of contusions and bruises, malignant wounds, pressure sores, swelling and ulcers. Fresh marigold juice should be administered as adjunctive therapy in the treatment of skin cancer - melanoma and age spots on the skin, and benign and malignant pigmentations. The diseased parts of the skin are coated with freshly squeezed marigold juice. Marigold baths are used since ancient times, and today are considered very effective for the treatment of haemorrhoids, genital herpes, vaginal infections, bladder infections, and many other conditions. It is made so that one up to two cups of fresh or dried marigold flowers are poured over with cold water and left to sit for one day. It is later heated and added to a warm bath. If you drink marigold tea in addition to the bath even better result are achieved.